Sign and symbol stickers. Everything from no smoking signs to biohazard and peace sign stickers. If you can't find the right sign you can create your own removable, vinyl die-cut stickers right here at StickerYou! For safety signs, directions, or just for fun, you can find all your sign and symbol stickers right here at StickerYou! Help keep the workplace safer by sticking all the important safety tips around the office. 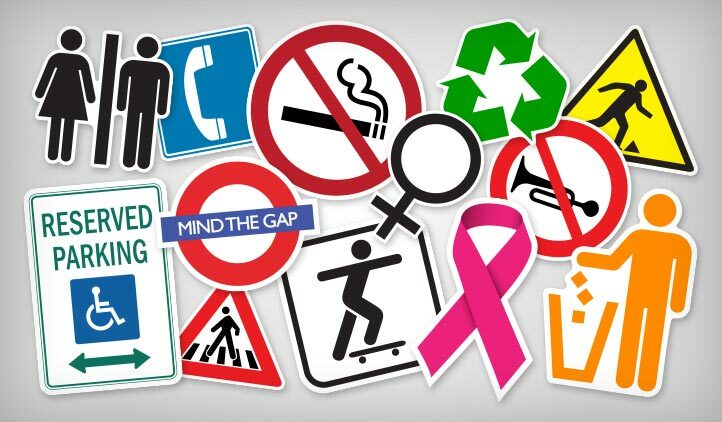 Whether there’s hazardous materials, company hours, or simply Men and Women’s icon’s to stick on the bathroom door, think safety first with stickers. Have some fun with the stickers, and make icons for around the office so people can easily find the bathrooms, photocopier, or meeting rooms. Choose from either clear or white vinyl material, and make the stickers to fit the size and shape of the area you need to stick. Our sign and symbol stickers stick strong on most materials, and go on smoothly. They are weather resistant, will stick strong on hard hats, and most materials. You can make your stickers ahead of time, then write on them when you’re ready with a pen or marker. Think safety first with StickerYou!